Masseria Il Trappeto is a stunningly restored olivemill just 1km from the historic town of Ostuni, set in an an ancient olive grove. Heated pool. The Evening Standard described it as 'the perfect place to come for a week with a gang of friends.' It has 7 bedrooms and 7 bathrooms. It has a large outside terrace with a stone table by the pool that seats 14. WIFI AVAILABLE. Josephine and James Pembroke have two properties on Owners Direct as they are easily the best Website in the UK. We bought our cottage in Purbeck, Dorset (E1782) in 1995. The cottage had been owned by the estate and was in need of attention. We stripped off the old wallpaper and unearthed the original flagstones and added the large kitchen conservatory in 1992. We bought in Purbeck as James had gone to school there and we were married in St James opposite Kingston Cottage. In the mid 90's we started looking for a small villa abroad and by accident we bought Masseria Il Trappeto, (IT2578). Which was a very large ruin which had not been used since the 1940's. That was a vast restoration project, which was achieved amazingly swiftly by Italian craftsmen. We love the area and the food. We came to Puglia and fell in love with the food, the Italians and the climate. We were looking for a family villa not in need of much restoration. We found a very large two storey ancient olive mill, which had been derelict since the 1970s. Within a year we had totally restored Il Trappeto into a luxury villa while still retaining and enhancing it's strong Pugliese character. Without the fantastic enthusiasm and skill of the local craftsmen and our brilliant Project Manager Ottavio we could not have completed this vast project. 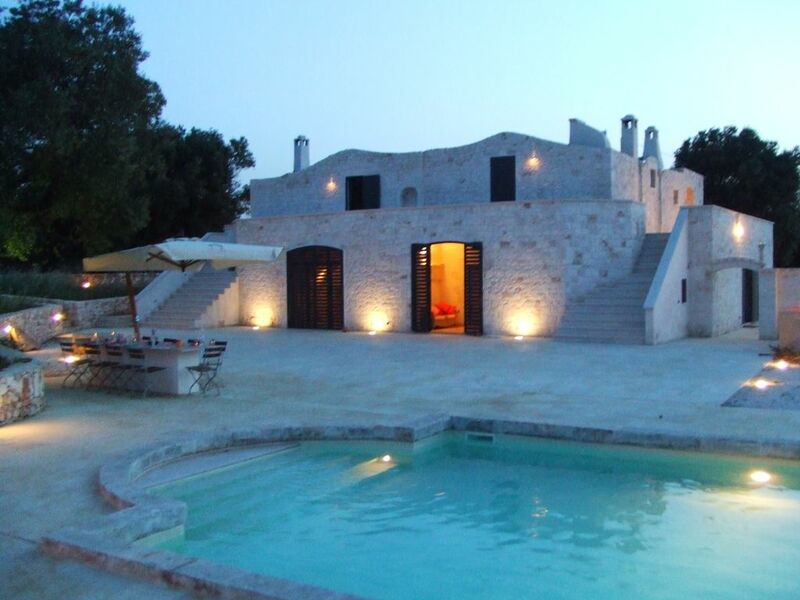 Masseria Il Trappeto is within an Ancient Olive Grove and is secluded and private. It has amazing views of the old town of Ostuni and the Adriatic Sea. It is a 20 minute walk or a 5 minute drive up to Ostuni with it's many restaurants, bars and fabulous shopping,. It is a 10 minute drive to the beaches and Villanova our nearest charming port with very good fish shops and the best foccacia. Il Trappeto is unique as most large properties in the area are b&b's but we are a private villa with a heated pool and an optional cook. Our villa is wonderful at low season we designed it with that in mind. We have underfloor heating, 2 working fires and piles of books and DVD's; we love it for Christmas, walks on the beaches and out for a long lunch (very reasonable too). En-suite, bed 1 with bath/shower over, wc, bidet. En-suite, bed 2 shower, wc, bidet. En-suite, bed 3 shower, wc, bidet. En-suite, bed 4 shower, wc, bidet. Family bathroom, bedrooms 5 and 6, double sink, shower, wc, bidet. Spare shower, ground floor. Air con is in all the bedrooms - apart from the small room on the ground floor which has a fan. Underfloor heating on the ground floor and radiators on the first floor. Egyptian cotton linen is provided. We have large washing machine in the laundry and a line to dry your clothes. 60sq.m sitting room with seating for 12. Italian TV, DVD player with ipod dock.Portable Sound system for CDs and ipods. WIFI Internet connection. Working fireplace. Dining room table which extends to seat 14. Cooker, fridge/freezer and fridge for chilling drinks, large hob, built in oven, 2 dishwashers, 3 sinks in kitchen, island. There is Italian TV and a DVD player. we have over 50 DVDs for all tastes. A large private garden and a limonetto. there is one very large terrace and terraces all around the property. The property would be suitable for wheelchair users as there are no steps on the ground floor where we provide 2 bedrooms and 2 bathrooms with no steps. We have a large heated swimming pool. Notes on accommodation: There are 4 bedrooms upstairs (4 doubles ensuite). The four doubles have separate entrances. Upstairs 2 of the doubles are joined to the house with a spiral staircase, these rooms also have interconnecting doors. Downstairs are 3 bedroom, 1 double, 1 twin and 1 single. We have found that families with small children (under 6) prefer to sleep in the downstairs areas as this avoids spiral staircases and stone steps. Air-con is in 6 of the seven bedrooms and we have two fans. We provide a travel cot and a high chair. The heated swimming pool has small steps for children to play on and a shallow end. We have 2 dishwashers. We also provide (at an extra cost): a shopping service, a cook, babysitting and daily cleaning. We have underfloor heating and 2 open fire places. Air-con is in 6 of the seven bedrooms and we have two fans. We also have a key holder who speaks fluent English and will look after you well. Outside: The property is in an ancient olive grove with a part walled garden. The garden was recently landscaped is has some palm trees, cactus and jasmine growing up the pergola. There is a large heated, swimming pool 6 x 12 metres and a barbecue area. There is a large covered stone table (seats 14), under an olive tree by the swimming pool. There is also a pergola with sofas and a coffee table. There is a car parking area for 6 cars behind the wall out of view and a washing line. There are 7 sunbeds by the pool and two umbrellas. The pool gets the sun from dawn until dusk. On the first floor of the olivemill there are sun terraces with views of Ostuni and the sea. Utility Room: Washing machine, ironing board, iron, dishwasher, sink. Cleaning / Towels / Linen / Maid service: All linen and towels and pool towels are provided, the property is cleaned once a week on Saturdays. You may have your sheets changed midweek at an extra cost. Other: Large circular limestone table in kitchen. Local limestone floor throughout. This property is beautifully done up by interior designers. There are 3 bedrooms on the ground floor and 4 upstairs. There are 2 outside staircases and 1 spiral staircase. Overall we had a fantastic stay at il Trapetto for my mother’s 70th birthday. We arrived on an early flight and were kindly allowed to stay by the pool while the villa was cleaned. Once we had settled in our contact Ottavio visited the next day to book taxis for the trips we had planned. During our stay he was responsive to our enquiries about local restaurants and beaches – he even arranged a pizza delivery for us! The property was lovely, with well-appointed furnishings and a well-resourced kitchen. There was a generous amount of living and sleeping space for us all (9 adults and 4 children) and entertainment for kids like the table football was an added bonus. The limonatta was also a lovely place to hold our evening meals. The pool was wonderful – during the day and night – but did need a mid-week clean because it is natural sea water. We had two relatively minor issues with the property. The first was the electricity, one of the dishwashers wouldn't work when the air conditioning was on in a few bedrooms. This meant that we couldn't put the dishwashers on at bedtime when we were all in our rooms. While we were there the electricity also tripped twice whilst we were out dining at the limonatta (there was a problem with the irrigation for the olive groves) which was frustrating. But in most instances this was resolved by Ottavio relatively quickly. The other issue was that due to the quite remote location of the villa there is no rubbish collection offered by the local council nor by the owners. In the end rather than using our holiday time to drive to the local collection facility we arranged for a private collection by Ottavio for €40. Ostuni town itself was beautiful - perfect for just wandering around and soaking up the atmosphere. We had a lovely dinner (all 13 of us!) at Osteria del Tempo Perso which we booked well in advance and the gelatos at Cremeria all Scalla were a big hit with the kids. Hi Naomi, thanks so much for the 5 star review, we are so pleased you loved Il Trappeto. Il Trappeto is a truly wonderful place to stay. A stunning villa with all we could have wanted, from beautiful and comfortable bedrooms to the magical outside dining room (limonetta). The villa is beautifully furnished, inside and out, with different areas to sit and read or play some of the many games that are on offer. It is enchanting; surrounded by ancient olive trees and with jasmine growing around one the outside 'rooms' furnished with pale pink sofas and puffed up cushions. Il Trappeto is in a great location near Ostuni (historic white-painted hill town with tiny, winding cobbled streets, fab food and funky bars) and the warm Adriatic dotted with superb fish restaurants (Rosa's being a particular favourite). We were very well looked after by Ottavio - any query was never too much. We had a wonderful week in this very special place and we highly recommended it. Il Trappeto is a fantastic villa in the heart of Puglia. The villa is very neat and clean, spacious (indoor table-tennis table) and well set-up for large groups with 2 fridges. With a few cool days we had the pool heated and this helped keep the kids wet and happy. We had a car to get in and out of Ostuni, but the villa's location is very convenient to the heart of the old Centro Storico and nearby parking. Ottavio was very helpful when we had a question, and we would also recommend the Puglian feast which he could organise. The villa stayed nice and cool on hot summer days, and to be surrounded by ancient olive trees added to the exotic feel. Shaded outdoor dining options meant we were rarely inside. We have stayed in many villas across Italy, France and Spain and rate Il Trappeto as the best. We will definitely be returning to Il Trappeto soon. We all wish to thank you so much for allowing us to stay at your beautiful and classy Masseria Il Trappeto. We all had a truly relaxing and wonderful time. The weather was marvelous and during the few days we were there we did manage to get to the beach where our Grandson played in the warm waves. He loved walking down the lane near the farm to watch trains toot at him and the kind lady there gave us pomegranates which we used in salads for lunch. Each evening we took a car to Ostuni and dined at different restaurants and enjoyed great food. Osteria del tempo perso was our favourite so that was where we went back to for our last dinner. We finished dinner with delicious ice creams in the square and then walked back to help lose the extra weight we had just put on! You really have a gem and we applaud your incredible achievement, it is simply fabulous and we recommend Masseria Il Trappeto very highly indeed. A big pat on Ottavio's back, he was so helpful. Thanks so much for the review we really do try to make Masseria Il Trappeto an unforgettable place! The most amazing holiday. The villa is very luxurious, everything we could possibly need, lots of bathrooms, fully equipped kitchen, interesting rooms , wonderful outside space. There are great views from the balcony of the town of Ostuni. Large swimming pool with plenty of outside seating areas including shaded areas. This is a truly fabulous villa with plenty of room for everyone. The villa is set in, and surrounded by,an olive grove. Olive trees are in abundance in this area, the countryside is very beautiful and interesting. The town of Ostuni is very lovely and unspoilt with wonderful restaurants, shops and beautiful buildings. There are many interesting excursions in the area and opportunity to visit the nearby coastal areas, where there are many wonderful seafood restaurants. villa is just so perfect. In fact we rate the holiday as our best ever. We stayed at Il Trappeto at the end of August and spent several days enjoying the beautiful villa, swimming pool and sampling the local cuisine. The villa itself has been restored to an incredible standard, it mixes the old with the new, with exposed brick throughout, alcoves, the 'nun's room' and modern bathrooms and kitchen. It is surrounded by olive groves, so ensures peace and quiet during your stay. The local town of Ostuni is a 10 minute drive away and is still very much an Italian town, instead of the usual tourist trap. There are plenty of restaurants and bars to choose from, often hidden away down stairs or in vaulted buildings, most of which are very reasonably priced and every one of our meals was faultless. The coast is another 15-20 minutes in the opposite direction and there are several fantastic restaurants to indulge in fresh seafood and local wine. The beaches themselves are more rocky than sandy but the sea is blue and refreshing to swim in. It is the perfect getaway for a family, group of friends or couples, I could holiday there every summer! Ottavio our Manager can arrange a four course Puglian feast, cooking demonstrations and wine and cheese evenings for you. He can also organise cycle hire. You can drive to many long sandy beaches in 10 minutes. There is kite surfing near by. Brindisi 30 minutes. Bari 55 minutes. We think car hire is recommended and bicycles are fun to hire (ask our key holder). You can walk to Ostuni on a very quiet road in 25 minutes. Martina Franca, 30 mins by car. 25 minute walk to Ostuni. Market in Otuni on Saturday, Wed and Friday. Lecce, 50 mins by car. There is a folder at the villa with all the information you need for a fabulous holiday; restaurants, beaches, culture, markets and you can email us with any requests. There is a supermarket 10 minutes drive from the olive mill which is open on Sundays in the summer.The lovely port of Villanova is 10 minutes away and has a small supermarket, fruit shop and the most amazing takeaway foccacia. Ostuni is up the hill and has everything including at least 5 fresh fish shops, with piles of fresh fish and amazing seafood. Wine is plentiful and cheap eating out is good valuel, a 3 course meal with wine about 15 euros. Or you can have a pizza in the evening for 3 euros. Booking Notes: Make an enquiry and find out if the date is available. Send 30% deposit to secure holiday (non refundable). We acknowledge cheque or transfer received by email. Full payment will be required 8 weeks before holiday. We also ask for a £300 damages deposit (fully refundable after inspection of villa). We will send you directions to the villa and the keyholder's phone number who you must contact to arrange where to meet. Changeover Day: Saturdays: arrival time 5pm. Departure 10am. But we are flexible, just enquire.